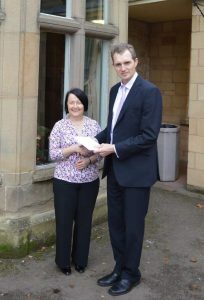 MONMOUTHSHIRE’S family support charity Home-Start has been presented with a donation of £500. Home-Start was chosen by the Ahmadiyya Muslim Community UK to be a beneficiary of its flagship Charity Walk for Peace, an annual event that has raised nearly £3m for good causes throughout Britain over the last 28 years. Monmouth MP David Davies, who has held discussions with Ahmadiyya Muslims in Parliament, presented a cheque on their behalf to Home-Start manager Pam Lloyd. Based at Bridges Community Centre in Monmouth, Home-Start Monmouthshire offers emotional and practical help to families with young children who are experiencing stress or difficulties. Pam Lloyd added: “It is always lovely when we receive unexpected donations that we haven’t had to canvass for and I would like to thank David for nominating our scheme. Share the post "New Year off to a good start for Monmouthshire charity"